Whenever I hear Ewan MacColl’s song The Big Hewer, it is Davey Hopper whose memory will be evoked. His sudden and untimely death just a week after the Durham Miners’ Gala seemed hard to believe. The evening before the Big Meeting, in the Royal County Hotel, my wife Margaret and I had been chatting to Davey about the state of the Labour Party and Jeremy Corbyn’s leadership, before we headed off to hear Corbyn speak to the Durham Miners’ Association (DMA) in the grand Miners’ Hall, a building known to everyone as Redhills. The next day, with the Big Meeting (the 132nd) having its largest attendance for over fifty years and after years of indifference by Labour Party leaders, Corbyn was the main speaker. The annual Gala was back in its rightful place as the main labour movement rally and celebration. Davey adopted his usual stance, not shying away from controversy and solidarity, supporting striking workers. This time it was the Durham Teaching Assistants, with Davey pointing to their banner. In his speech of introduction to speakers, Davey, as always, had that mischievous irreverent humour which gave emphasis to the issues. Nobody there knew then that it would be the last time his booming north-eastern voice, that of a Wearsider, as he would remind me, would be heard. Davey began work at Wearmouth Colliery, where Sunderland Football Club stadium now stands, in 1958 where his dad, a union safety inspector and dedicated NUM member, was a miner. Davey himself was now also a miner, and he was encouraged by his dad to attend the Wearmouth Lodge (his local union branch), where he was on the Lodge Committee. However, it was the solidarity and underground co-operation and dependency on your ‘marra’ (a stronger term than ‘mate’) that was to be the basis of Davey’s socialism. By the 1960s, married with three children and working at the coal-face, he was to see the end of ‘piece work’ (where the men picked the face teams and the whole team shared the piece-rate earnings equally) through the introduction of the National Power Loading Agreement. Davey saw his pay halved and its effects on his family (with four children by 1970) were considerable. Davey took an active part in the 1972 miners’ strike for higher wages, which resulted in substantial increases. He always said that it was his involvement in that strike which increased his interest in the union, and more particularly in socialism. He read with great interest the history of the miners, the labour movement and socialism. This continued through his life and he liked nothing better than to discuss what he had read and proposed to put into practice, as I and others came to know. He was the quintessential miner autodidact. The militancy of the strike and his developed awareness was to bring him into conflict with the right-wing leadership. As part of the Left Group of mainly young rank-and-file miners, aptly titled the Durham Left, in the late 1970s, he was to campaign for a more progressive policy, especially in relation to the approaching pit closures. Alan Cummings, DMA President, has recalled those days when through this broad left group and along with other likeminded colleagues they were able to make democratic changes to the DMA. In 1981 they were successful in obtaining a rule change regarding elections to the union’s Area Executive Committee and Davey was elected in 1982. Davey’s leadership potential was being recognized; he became the first rank and file Durham miner to be elected to the union’s National Executive Committee in 1983 and was voted in as Secretary of his lodge. It was at the start of the Miners’ Strike in 1984 that I first met Davey. As a trade union Regional Secretary I had an agreement from my Area Executive that we would send out details about and contacts within Coal Communities Women’s Support Groups to our branches. Information from Northumberland was immediately available, as I knew the officials, but it was less easy to obtain for Durham. I did not know Tom Callan, General Secretary of Durham NUM, at all; he was not active in TUC or Labour Party regional politics, where I was well known as being on the left. This may be why he was slow in replying to my request, but I was anxious to get this information out to branches. Through Sunderland Trades Council, I met Davey. His colliery had supported my members in the Coles Cranes occupation, opposite them on the Wear, in the 1970s. As my office was in Sunderland, I was able to meet him and a colleague and, true to his word, by that afternoon I had the information, and he also put me in contact with Davey Guy, Labour activist at Dawdon Colliery. The involvement of Davey and his family in the strike was all-embracing, not only in terms of commitment but also in leadership and at the forefront of advocacy. This often brought him headlines in the media with some difficult situations affecting him and his family, but they solidly supported the strike right up until the defeat. He would often talk about this hardship of the mining communities without mentioning his own personal and family hardship, as an article in the Tyne & Wear County Association of Trades Council’s journal, Rostrum (New Year Edition 1985) demonstrated. Nor, as others have recalled, did he talk of the harshness of comments he faced, sometimes even from comrades. He always shrugged it off; it was their fear and struggle talking. His venom was retained for the employer and the Thatcher Government. The strike and its ending is part of labour movement history but for Davey and the coal communities it was also a threat to culture and tradition. Davey was elected General (Regional) Secretary of the Durham Miners after the strike. Alongside the President, Davey Guy, he set about changing the insular nature of the union with the rest of the labour movement. Whilst negotiating strongly, they were hampered by the Coal Board, at the command of the Tory Government, escalating pit closures, redundancies and harsh work practices. The main task initially was fighting for the men sacked or facing charges. By the time Monkwearmouth, Davey’s colliery, and the last pit left in Durham, closed in 1993, the union’s resources had been exhausted by the strike with no working miners left to pay subscriptions. But the ‘two Daveys’ stayed and the DMA continued, its role being that of representing ex-miners at tribunals and linkage to welfare agencies. They embodied the desire of their marras that the coal communities, their villages, their mining heritage and their place in the collective labour movement should be maintained. That meant saving that great festival of miners and their families, the Durham Miners’ Gala, the pitmen’s Big Meeting. It was agreed that the Big Meeting would now be a celebration, led by the miners’ banners of all trade unions, and all elements of the broad labour movement with their banners. With the two Daveys’ support and encouragement, many in the coal communities set up Community Banner Committees to refurbish historic banners or where necessary make replicas. The Gala is not only a festival of the labour movement, both local and national, but also the occasion for those engaged in struggle, at home and internationally, to participate and speak from the platform. Davey was a passionate internationalist and anti-fascist, and hated discrimination of any kind. He stood no nonsense about whose banners should be represented, as long as they embraced a socialist principle. He won that argument and that’s what we witness now. In particular, I know that Davey overcame years of cultural and negative prejudices towards women’s activism and the LGBT community, through the solidarity and active participation he experienced during the strike. He also read, listened and discussed the issues, and spoke forcefully on the subject in the Irish Club in Newcastle. He wasn’t afraid to say that he had been wrong. When Davey’s wife Brenda died at the early age of fifty-three, November 1997, the Hopper family was heartbroken and it was a stressful time for Davey. He had lost the one person who for thirty-one years had been at his side throughout the struggles. Friends knew they were devoted to one another. Davey always said it was the comradeship and sincere compassion of the communities that pulled him through these personal dark times. Under his leadership the Miners’ Hall at Redhills in Durham became a centre for local and national campaigns, worker’s art exhibitions, films and debate. His association with other campaigns and solidarity action was exemplified by his regular invitations to Ireland as a speaker at the annual memorial parade in honour of Jim Connell, who wrote the Red Flag in 1889. He enjoyed the folk singing at congresses and party conferences. He was a member and good friend to the North East Labour History Society, submitting the occasional article and paying for space in the Society’s annual journal to pledge the DMA. He was a man of many parts. From the beginning of the new century, Davey voiced his opposition to the Blair government’s refusal to reverse Thatcher’s anti-union legislation. He campaigned passionately against the wars in Afghanistan and Iraq, expressing his disapproval from the Gala platform and reasoning that it was a betrayal of working folk. He was to remain always on the side of those in struggle and castigated two Labour Party leaders, Kinnock (1983-1992) followed by Blair (1994 -2007), for not having the courage to appear on the Gala platform when previous leaders were prepared to attend, even if it meant being barracked. It was not until Ed Miliband attended in 2012 that a Labour leader again appeared on the Platform. Among many international struggles, Davey played an important role in Cuban Solidarity. It was through this involvement that he met Maria Zarzabal, whom he married in 2006, becoming stepfather to her two children. Friends said it gave him a new lease of life. At the reception in Dawdon Miners Welfare Club following Davey Guy’s funeral in 2012, Davey spoke with some emotion about their work together for the miners, the coal communities and the labour movement. Everyone felt a sense of sadness and he recalled the loss of other activists in the union. Apart from his passionate support for socialism, Davey enjoyed the dog racing at Boldon and his beloved Sunderland Football Club. The Monkwearmouth Colliery banner was hung in the Club’s stadium entrance where the colliery had been sited. Not shy of argument and noting local racist activities, in 2013 as part of the anti-fascist campaign Davey demanded the banner be taken down when Paolo Di Canio was appointed coach. He highlighted Di Canio’s statement that he was `a fascist, not a racist’ and the evidence of him giving Italian fascist salutes. Di Canio lasted six months; it may have been the winning of only three games, but I’m sure the anti-fascist campaign helped! After speaking in support at Jeremy Corbyn’s Newcastle hustings rally, he was immensely happy when he was elected party leader. You could see the pleasure it gave him to introduce Corbyn, as a speaker at the 2016 Gala and inviting him to return in 2017 after his re-election. After such a magnificent Big Meeting, Davey was set for further campaigning but it was not to be. The night before the funeral, to celebrate his life, a wake was held with a few speeches and music, not mournful but happy jig music. The Sacriston Club was full to capacity, including many miners and families, trade union activists, local and national officials, actors, in fact a broad spectrum of politics and community. On 29 July 2016 I arrived early in the morning at Redhills as the attendance was beginning to grow. Outside the Miners’ Hall there was a marquee and sound system, a colliery band and banners from miners’ and other unions. As I stood at the entrance awaiting the funeral cortège, with the band playing and the banners flapping in the breeze, I witnessed something that had never happened in the history of this century-old building. As the band played the miners’ hymn, Gresford, the coffin, followed by his family, was taken into the Debating Chamber, where Davey had chaired many meetings, to be met by the sound of Bob Marley. Rodney Bickerstaffe, the veteran national Labour and trades union figure, former General Secretary of UNISON, acting as humanist celebrant, led the commemoration. There were eulogies from Alan Mardghum, a mining activist and long-time friend who took over as lodge secretary from Davey, and from his friend, Geoff Shears of Thompson’s, the solicitors who work in close partnership with the DMA. Many were tearful during a highly poignant moment listening to Paul Robeson’s recording of Joe Hill. Jeremy Corbyn and Alan Cummings, chair of the DMA, both spoke. A respectful silence for Davey was followed by Bethany Ellen Coyle, founder of the North East Socialist Singers, leading us all in the Red Flag. The chamber had been full and hundreds lined the exit. It was estimated there were 900 people, but there may well have been more. 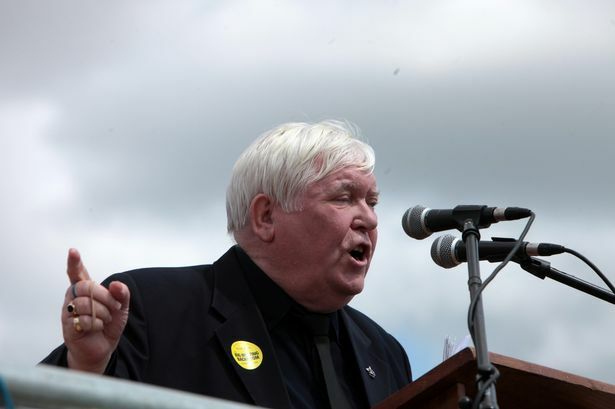 Alan Cummings said that Davey’s legacy would surely be the Durham Miners Gala, which has grown over the last few years to rival the turn out in the 1960s. Jeremy Corbyn wrote of him being a pillar of strength for the working class, a huge loss who would be greatly missed. But Davey Hopper’s spirit will live on through his beloved Big Meeting, the great working class gathering celebrating our traditions, history and struggle.